Ear problems can be excruciatingly painful, especially in children. With 10 million new cases every year, ear infections (otitis media) are the most common illness affecting babies and young children and the number one reason for visits to the pediatrician -- accounting for more than 35 percent of all pediatric visits. Almost half of all children will have at least one middle ear infection before they're a year old, and two-thirds of them will have had at least one such infection by age 3. The symptoms can include ear pain, fever, and irritability. Otitis media can be either bacterial or viral in origin, and frequently results from another illness such as a cold. For many children, it can become a chronic problem, requiring treatment year after year, and putting the child at risk of permanent hearing damage and associated speech and developmental problems. Standard treatment for most cases of otitis media is with antibiotics, which can be effective if the culprit is bacterial (antibiotics, of course, do nothing to fight off viruses). But, according to many research studies, antibiotics are often not much more effective than the body's own immune system. And repeated doses of antibiotics can lead to drug-resistant bacteria that scoff at the drugs, while leaving the child screaming in pain. Frequent ear infections are also the second most common reason for surgery in children under 2 (with circumcision being the first). In severe cases -- for example, when fluids from an ear infection haven't cleared from the ear after several months, and hearing is affected -- specialists sometimes prescribe myringotomy and tympanostomy, more commonly known as "ear tubes." During the surgical procedure, a small opening is made in the eardrum to place a tube inside. The tube relieves pressure in the ear and prevents repeated fluid buildup with the continuous venting of fresh air. In most cases, the membrane pushes the tube out after a couple of months and the hole in the eardrum closes. Although the treatment is effective, it has to be repeated in some 20 to 30 percent of cases. And this kind of surgery requires general anesthesia, never a minor thing in a small child. If the infection persists even after tube placement and removal, children sometimes undergo adenoidectomy (surgical removal of the adenoids) -- an option that is effective mostly through the first year after surgery. Before yet another round of "maybe-they'll-work-and-maybe-they-won't" antibiotics or the drastic step of surgery, more parents are considering chiropractic to help children with chronic ear infections. Dr. Joan Fallon, a chiropractor who practices in Yonkers, New York, has published research showing that, after receiving a series of chiropractic adjustments, nearly 80 percent of the children treated were free of ear infections for at least the six-month period following their initial visits (a period that also included maintenance treatments every four to six weeks). "Chiropractic mobilizes drainage of the ear in children, and if they can continue to drain without a buildup of fluid and subsequent infection, they build up their own antibodies and recover more quickly," explains Dr. Fallon. She'd like to see her pilot study used as a basis for larger-scale trials of chiropractic as a therapeutic modality for otitis media. Dr. Fallon uses primarily upper-cervical manipulation on children with otitis media, focusing particularly on the occiput, or back of the skull, and atlas, or the first vertebra in the neck. "Adjusting the occiput, in particular, will get the middle ear to drain. Depending on how chronic it's been and on where they are in their cycle of antibiotics, children generally need to get through one bout of fluid and fight it off themselves." That means, for the average child, between six and eight treatments. If a child's case is acute, Dr. Fallon will check the ear every day, using a tympanogram to measure the ear and track the movement of the eardrum to make sure that it's draining. "I'll do adjustments every day or every other day for a couple of days if they're acute, and then decrease frequency over time." Dr. Fallon, whose research garnered her the acclaim of childrearing magazines like Parenting and Baby Talk, often sees great success when she treats a child for otitis media. "Once they fight it themselves, my kids tend to do very well and stay away from ear infections completely. Unless there are environmental factors like smoking in the house, an abnormally shaped Eustachian tube, or something like that, they do very well," she says. "I have two large pediatric groups that refer to me on a regular basis. In the winter, when otitis is most prevalent, I see five or six new children each week from each group," says Dr. Fallon. "It's safe and effective and something that parents should try, certainly before inserting tubes in their children's ears." 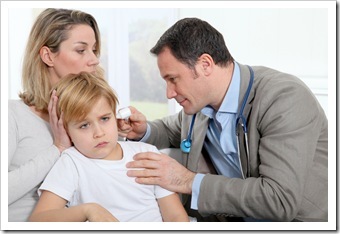 Talk to your doctor of chiropractic about your child's ear infections. Doctors of chiropractic are licensed and trained to diagnose and treat patients of all ages and will use a gentler type of treatment for children.